Barnhaven has been in existence as a primula and polyanthus breeder for more than eighty years now, and we are very proud of its traditions. We operate from a small family run nursery which has three shade tunnels and two plastic covered tunnels that are open at the sides. Our primulas are grown to be hardy. They are over-wintered on benches in the open-sided tunnels or on matting or gravel in the shade tunnels. Our collection of Show auriculas is grown under one of the plastic covered polytunnels with extra shade netting so that the plants are not too hot and get plenty of ventilation. This gives them protection from rain, but leaves them exposed to the cold. All our pollinating is done by hand in these tunnels and it takes a fair amount of dedication to spend days at a time with only fingers moving in cold, windy and damp weather. As the pods start to swell, there is a long battle against caterpillars, aphids, rots, birds and mice. Seed pods are picked singly and it takes skill and experience to harvest at the optimum moment. Once they have dried, seed is extracted from the pods by hand. All seed is stored under refrigeration until the moment of despatch. The amount of seed we have available varies considerably depending on weather and pollinating factors. There is a minimum number of 35 seeds per packet (except where stated otherwise) but there are usually many more and we try to be generous when we can. We want you to love our primulas and polyanthus flowers as much as we do and we take enormous care to ensure that your seeds reach you in good condition. Please follow our growing instructions carefully, and please keep your seeds in the fridge if you are not sowing immediately. We have developed our plant sales so that we now carry good stocks of most series. Our collection of show and garden auriculas has also greatly increased and there is a good selection available. We sell direct from our nursery, at plant shows and by mail order. 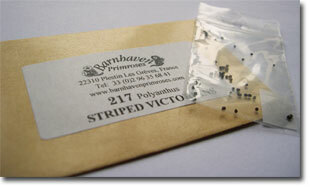 Our special plant packaging enables us to ensure that your plants arrive in excellent condition. Each packet contains three plants in 7cm pots. These are mature plants with established rooting systems ready to be planted into the ground or window boxes and containers. They have been grown in open tunnels, exposed to wind and frost and therefore will not fear the open garden. These are sent out in 7 cm pots and can be quite safely left in them to further develop. If you wish to change their pot do not be tempted to use one too large as auriculas are happier with their roots somewhat restricted. 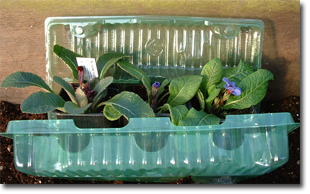 Show auriculas are often cosseted a little in cold greenhouses or frames to protect them from excessive wet. However the alpines, borders and doubles could be safely planted out if you wish in well-drained soil. Please consult our How to order page for further information on our terms and conditions.